If you aren't familiar with the book, What's Under Your Cape? Superheroes of the Character Kind by Barbara Gruener, you should really give it a read. 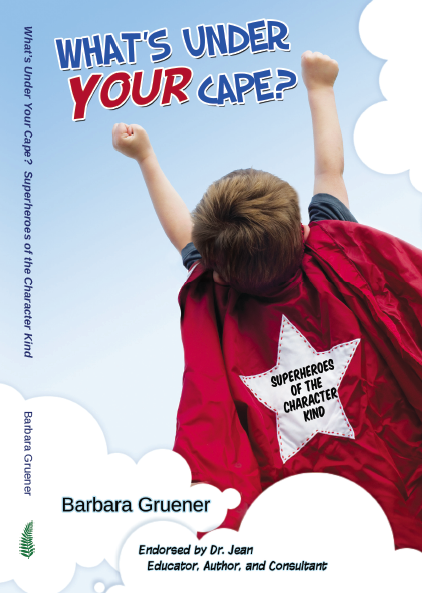 Barbara is also the author of the blog, Corner on Character, and always has great ideas and resources for how to build character in your school. I think too often, educators don't have time to add character lessons. Common Core instruction has everyone in a panic to cram specific ELA and Math skills into the curriculum which in turn leaves little time for anything else. . .except testing. Character, however, is what defines us as individuals. It is life's little lessons. As counselors, I think we strive everyday to impact the lives of the students we work with, and everyday we do teach character--how to get along with friends, how not to bully, how to be respectful to all, how to play nice in the sandbox. Tomorrow is Mix it Up Day. Another opportunity to teach these skills, and another opportunity to teach students how they can make an impact on the world. The Sage Colleges (where I went to grad school to become a counselor) has an Academy for Character Education. NYS schools can even become a NY School of Character. Barbara's school is a National School of Character, due in a larger part to her hard work. I think this year I will apply. Our #iinspireproject is just one example of how we are teaching students to take ownership in how they can make a difference to others. Our 5th and 6th grade students are lucky too, as each one of them will take a class in character education all year long. To help get you going on how to promote character at your school, I would like to offer you a chance to win Barbara's book (she's even going to sign it for you!). Just follow the instructions below for your chance to win. Thank you, Carol, for your kind endorsement of my book. I feel honored to have a spotlight on your blog as I continue to be inspired by you and your work. I am in the midst of my internship, and am now in both an elementary and middle school environment. I would be honored to receive this book as I begin on my new journey as a School Counselor. Thank you for such a great giveaway! I would first discuss the word character with both students individually and in groups. What does this word mean? To assist the students, I would lead by example, and discuss how decisions and actions shape and define our character. Activities involving character would be used as well. Oh the possibilities ... ! I have always had a Virtues Curriculum for 3-5 year olds in long day care,but I would dearly love more incentive to take it to the next level. character education needs to be immersed into every early Childcare environment,as it quells challenging behaviour and exemplifies the need to look outside oneself,self regulate in time and form empathy and value diversity.